Finding the right gifts for a child at any age can be stressful and hard. Most parents struggle with money when buying gifts. Kids toys can be so expensive this time of year. That is why it is always best to shop around first before buying the first thing you see. This way you can find better deals and you can save money for Christmas. My Voucher Codes have created a Christmas gift finder monitor where you can find the gifts you want to buy and compare prices with other retailers. We all want to save money for Christmas don't we?! Wooden toys are fantastic for every child, any age (recommended age 18+). Easy to clean and they will last much longer than plastic toys. This wooden stackeroo is great for a child who is learning about colours and learning about co-ordination. There are 7 bright colours and is aimed to help the child learn about 3D. This is one my girls favourite toy. With over 150 pieces with this brilliant post office from Early Learning Centre, your child won't be bored. It's great for a child to pretend play and learn whilst they are playing too. Another pretend play gift. Every child loves to dress up, don't they? This Monkey cape will be great for any child who loves to dress up and be silly. This Pabobo night light is perfect for any child who is scared of the dark. This night light gives a nice dim light into the room. Not to bright to wake up or keep your child up. This light is perfect to help a child fall asleep peacefully. Great Gizmo have some fantastic toys and I was lucky enough to review some toys and two gorgeous soft teddies last year. They are perfect for young babies and toddlers. Even great for young children who loves teddies. Kids will have lots of fun with this pancake pile up game. My girls loves playing with this game and it's a fun family game for Christmas, any other occasion or just a normal day. You have probably heard of the Innotab 3S. This Innotab is great for learning young children a few things. It comes with a camera that faces both ways and some games already downloaded. You can buy additional games online or in the shop. The child can make their own personal profile with their photo and name. This will keep them entertained and busy for a couple of hours but also they will learn a few things out of it too. Do you have a baby/toddler or young child who struggles to sleep? Mama Koala Bear may be your answer. This soft koala with different soothing noises will sure help your child settle down too sleep. This book is fantastic for a child to learn and spell their name. Each book is personalised and each child will go on a fun adventure to find each letter of their name. These gorgeous party bags would be great for parties and any other occasion such as Christmas. For the girls they have some gorgeous tutu bags which are carefully handmade and made perfectly. You will not be disappointed. Each bag is filled with many things related to the bag you have chosen. Of course after Christmas toys need to be kept somewhere. This wooden shack toy box is great for storing toys. It is not too deep for a child to search for toys and it is a strong well made wooden toy box with colourful pictures on its front, sides and back. These gorgeous jewellery is perfect for any little princess who loves necklaces, earing and bracelets. With many different designs too choose from you will want to buy everything! and at great prices too. Lovely range of gift ideas, I especially like the windmill stacker. Big fan of wooden toys. I have to say I did get some black Friday bargains today! Good luck with the rest of your shopping, its a jungle out there! What a great idea saving time and money! Some great choices love the name book and the post office!! I love the lost my name books, and that toy chest is gorgeous! 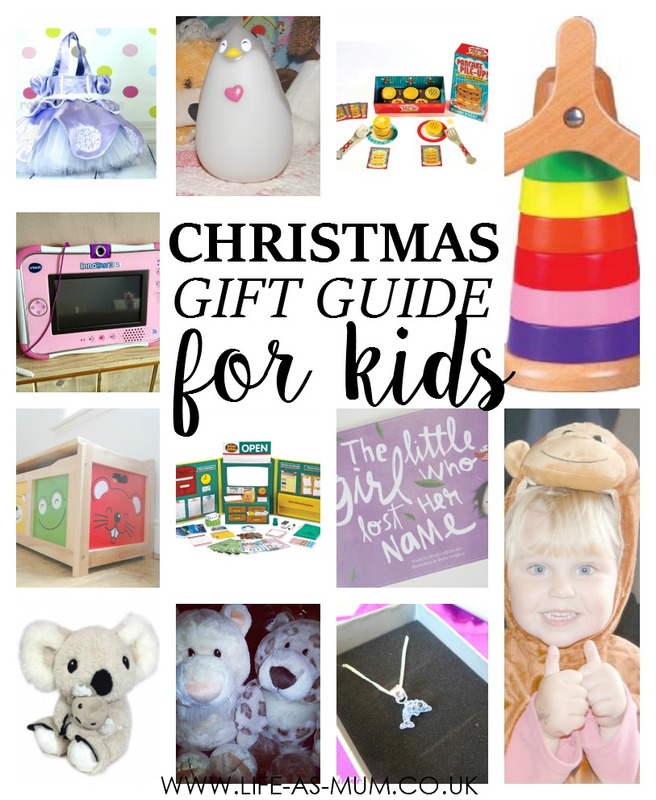 Great ideas and I love the idea of the gift finder! That toy chest is such a good idea, it isn't something that I would have thought to buy for Christmas but I'm not sure why! Great list! I love the stackable windmill it's brilliant!